If you've been anywhere near a park, college campus, or beach lately, you've probably seen more than one group of people playing some new beach game with small trampoline and ball. What is this new craze that has seemingly popped up out of nowhere? It's actually a relatively new sport called Spikeball and it's growing in popularity, particularly amongst teenagers and young adults, for some pretty interesting reasons. 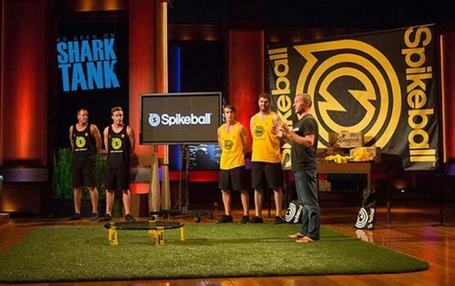 Who Invested in Spikeball From Shark Tank? Who Came up with Spikeball? How Do You Play Spikeball? If you're like me when I first learned about Spikeball, you're probably wondering what in the world is going on. I recently had the opportunity to try the game out for myself and, I have to tell you, it's a lot of fun. The best way to describe it is an interesting mix of volleyball and four-square, with a bit of racquetball (without the racquets) thrown in. Spikeball is played between two teams, with two players each. The only equipment you need to play the game is a ball and a miniature, high-tension trampoline, roughly the size of a hula hoop. You can purchase an official Spikeball set for a reasonable price, although it doesn't seem like it would be too difficult to make your own if you wanted to. This super simple, yet surprisingly fun game was first seen on Shark Tank in 2015 and has really taken off since then. The creators managed to land a deal for $500,000 to launch their product while on the show, which is a pretty impressive feat for such a simple concept. Their excitement for the possibilities of the game and obvious drive to succeed are what ultimately pushed them over the edge and launched them toward the success they enjoy today. Daymond John, a widely celebrated entrepreneur is the Shark Tank star that saw the potential Spikeball had and was quick to invest in the company. This isn't at all surprising, given John's love for sports-related products. He has also invested in companies like One Sole, Hells Bells Helmets, GoGoGear. While Daymond John isn't only known for investing in sports companies, his portfolio does boast a rather large number of them, making Spikeball and John's a perfect fit for one another. It's no surprise the game has been so successful in recent years, given this dynamic partnership. 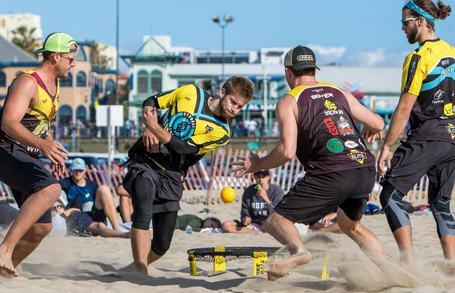 Spikeball was created by a Chicago-based startup company and the game is the original brain-child of the company's CEO and founder, Chris Ruder. Ruder started the company as a part-time gig and Shark Tank producers have commented that he is a driven and effective negotiator, which explains how he was able to secure a half-million dollar deal on the show and grow the company into what it is today. Ruder was able to secure the money needed to get the company on the ground while only surrendering a total of 20% equity in the company to Daymond John, which is impressive all on its own. The company now employees only eight people, but generates approximately one million in sales every year. What's even more impressive is none of the company's employees work full-time. The game itself is pretty simple. It's a 2-vs-2 game consisting of a small ball and a miniature trampoline, about the size of a hula hoop. The game is started when the player from one team serves the ball by spiking it onto the trampoline net, putting the ball into play. Each team is allowed to bounce the ball between them up to three times before the ball is required to hit the net again, transferring control to the opposing team. This continues until one team either exceeds the three-hit limit or fails to hit the net, at which point the opposing team scores a point. Sounds pretty simple, right? For more details, let's take a quick look at Spikeballs' official set of rules. The sport of round net is played 2 vs 2, with a hula hoop sized Spikeball net placed between the teams. A player starts a point by serving the ball down on the net so it ricochets up at his opponents. ​They have up to three hits between them (just like Volleyball) to control the ball and bounce it back off the net. ​When they miss, you score. ​Did we mention that there are no boundaries? ​Once a point starts, players can move or hit the ball anywhere. ​2 vs 2 - Team sport played 2-vs-2 with the ball put into play with a serve. ​360 Play - After the serve, players can move anywhere with no sides or boundaries. ​3 Touch - Players must alternate touches and have up to three to return the ball to the net. Scoring - Points are scored when the ball hits the rim or the ground or bounces more than once on the net. As you can see, the rules themselves are pretty simple and straightforward. Don't let this fool you though. The game can get very complicated and intricate, with the best players employing some well-practiced tactics, which we'll discuss a little later. Whether you're trying to making sure you have enough room to play Spike ball safely and effectively, or you're interested in fashioning your own DIY Spikeball set (something a lot have people have been doing lately), it may be helpful to know what kind of dimensions you'll be working with. Luckily, the game requires minimal gear, so you really only need to concern yourself with the dimensions for two items: the net (miniature trampoline) and the ball. 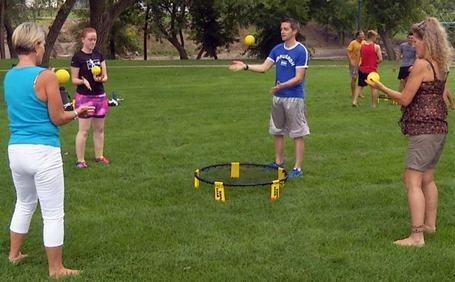 The official Spikeball net measures at 36-inches in diameter. Some people have different preferences, so you'll see some DIY sets that have smaller (for a greater challenge) or larger (for a more forgiving game, good for kids or people new to the game) surface. The official Spikeball net measures at approximately 6-inches off the ground. Some DIY sets will have slightly different heights, but I don't really recommend going lower than 6-inches, otherwise, you're sacrificing bounciness, making the game difficult to enjoy. The official Spikeball dimensions for a ball measures at 12-inches in circumference. Do not use a hard ball. Do not use anything like a basketball, soccer ball, or volleyball. ​Do not fully inflate your ball. ​Do inflate your ball so it has just a bit of bounce and firmness to it, but still feels squishy. Believe it or not, there is a semi-professional league of skilled and experienced players beginning to form around Spikeball. Yes, the game is actually getting that popular! 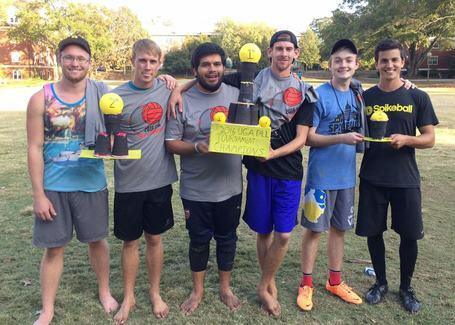 If you've been playing for a while and you think you've got it takes to compete with other top players, or if you're just a super competitive person, you should definitely check out some of this year's Spikeball tournaments. Each tournament is unique and some even add more advanced rules to the game for an extra challenge for the most skilled players. Even a basic tournament is extremely competitive and if you like a good challenge, there's a lot of fun to be had here. If you're not quite sure about competing on this level just yet, Spikeball tournaments are still a lot of fun to watch and a great way to pick up some advanced techniques and learn from some of the game's best players. This year looks to be the most active Spike ball tournament yet, so I strongly recommend looking around for some tournaments that might be taking place near you. If you're looking to up your game, here are a few tips for you to consider. Some of them may sound a little counter-intuitive, but I promise I have your best interested at heart, so bear with me and read all of them through to the end. Try not to be the best player. (At least not all of the time.) Ok, what do I mean by this? It's really a pretty simple concept if you think about it. Everybody wants to be the best in a competitive sport, but how can you realistically expect to get there if you only play against people you know you can beat? You should actively seek out players you know are better than you and play against them whenever possible. This will allow you to observe their techniques while forcing you to improve your game as you strive to eventually beat them at their own game. Try to be deceptive. Have you ever seen some of the best players in basketball fake out their opponents? This can be a really effective tool in Spikeball too. Try to learn to use your body language to make the opposing team think you're going to go somewhere you're not. But throwing them off balance, you'll gain the upper hand and win more game than you lose. Don't be afraid to get hurt. Look, this is a physical sport, so let's be honest here. If you're trying to avoid dirt on your clothes and scrapes on your knees, Spikeball may not be the game for you. The best players are willing to throw their body across the field and get a little banged up to prevent the other team from scoring. If you want to be the best, you'll need to do the same. These are just a few basic tips and I really wish I had time to give you some more. But the best advice I can give is to keep practicing and don't be afraid to lose. It's going to happen and those losing games are usually where you're going to learn the most about how to win in the future. Don't give away your play. A straightforward serve, especially to an experienced opposing team, is like an open invitation to take control of the play right off the bat. Try to use deceptive body motions or even put some spin on the ball while you're serving so your opponents don't know exactly where the ball is going to go. The more you can get them to scramble in your initial serve, the greater your upper hand will be. A hard serve is not always best. This isn't table tennis. 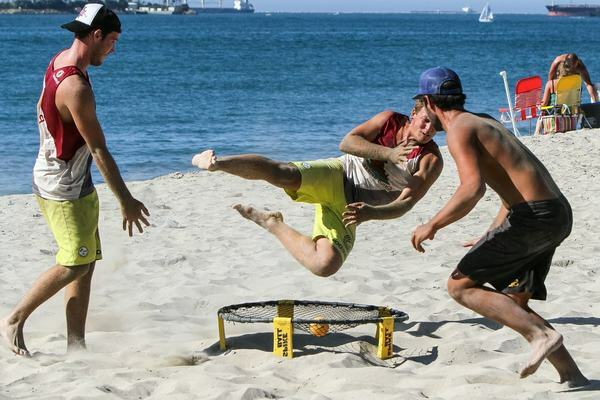 You're going to need strategy more than brute force to win at Spikeball. Try to observe your opponents for weaknesses and openings in their defense. Taking advantage of this during your serve can make for some pretty short plays that work to your advantage. Spikeball is available at a number of retailers, both online and in brick and mortar stores. Our favorite place to look for Spikeball and its related accessories is on Amazon. When you buy through Amazon, not only do you get support from Spikeball, but you also have the customer service team at Amazon backing you up if you ever need support. Plus, Amazon offers some of the best shipping options available, especially if you're a Prime subscriber. I've tried to give you as much information about Spikeball as I possibly can. Even with such a simple game, though, there's a lot of information to cover and I never seem to have enough time to go over everything I would like to with you. Hopefully, I've at least been able to answer your basic questions and the next time you see someone asking about that beach game with small trampoline and ball, you'll be able to educate them a bit. If you're feeling up to it, maybe you can even challenge the players to a game and impress your friends with your newfound knowledge.